Last weekend, my family celebrated Holi for the first time in the US. It isn't my favorite festival. I hated stepping out on Holi because I was a sure target for water balloons tossed from the 3rd or 4th floor. They hurt. People who refused to make eye contact through the year were suddenly pouring water all over me, touching me and plastering my face and clothes with color. No, thank you. I used to call it the "touch your neighbor's wife anywhere you want and get away with it" festival. This was Rangpanchami or Dhulivandan. Mali-dada would crack open the coconuts we had given to him for prasad and then most of the women and kids would go to the terrace at the top of the building where much merriment would occur under the full moon, sans bhang. We didn't partake of any celebrations in Chicagoland as it was always too cold and messing with powdered colors indoors was not something anyone was willing to take on in their homes. It was different last weekend: the weather held out at a breezy 60F with no rain or snow. Perfect for Holi. We went armed with our Super Soaker but it was a little too breezy for that and Medha was disappointed. She's quite an ace when it comes to making sneak attacks and using the flash flood mode to douse her opponent with water. She made up for it by having a blast with the colors - apparently they smelled good, too. She was quite enthralled by her hair which soon had hues of purple and orange; a shower was the last thing she wanted to do once we got home. Later in the week, she came home excited that the Time for Kids for that week had a picture of kids in Ahmedabad celebrating Holi. Puran poli is the traditional food for Holi. I don't celebrate Holi and I don't make Puran poli. Instead, I made whole moong dal. This recipe boasts a flavor that I had been trying to recreate from memory for what seems like forever. It is based on this recipe and is a keeper. There is no need to molly-coddle the whole moong with an overnight soak. A pressure cooker is all you need to ensure the soft creaminess of these beans. 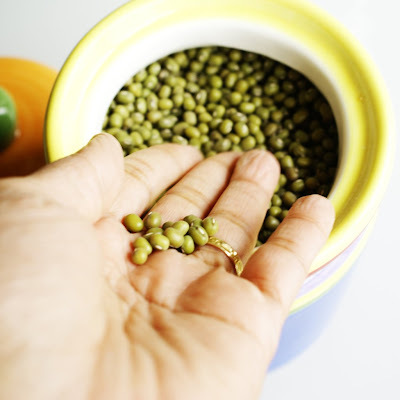 Rinse the whole moong beans, drain and set aside. Heat the ghee directly in the pan of the pressure cooker. Add asafetida, bay leaf, cinnamon, cloves, and red chillies, followed by cumin seeds. Add chopped onions and cook until they have softened some. Add turmeric powder, green chillies, ginger, garlic, and tomatoes. Cook for a few minutes. Add whole moong and approximately 4 cups of water. Cook on a high flame for 2 whistles. Turn the flame to low and cook for about 45 minutes. Do not release the built-up pressure; instead allow the pressure cooker to cool on its own. When you can open the pressure cooker, adjust for seasonings, garnish with some cilantro and serve hot with rotis or steaming hot rice. What I love about this recipe, apart from its fabulous flavors, is that I don't need to plan a day ahead if I want to make this for dinner. One could soak the moong but it's not necessary. Ghee adds a wonderful dimension to the phodni. The original recipe suggests using some tomato paste to add an appealing color to the dish. It imparts no additional flavor so I skip that part. To up the heat, increase the number of red chillies in the phodni and/or green chillies and/or red chilli powder. Try it. It's a recipe you will want to make again and again. I think I will try it...but of course, I will soak the moong! It's not called mollycoddling! Just cuts down on the cooking time by a few minutes...that's all. Happy Hoil! In Delhi, we spare strangers so, no touching-your- neighbour's-wife-and-getting- away-with-it. Thank God. But I hate when they rub the dry colour into your hair - such a pain it used to be to get it out. 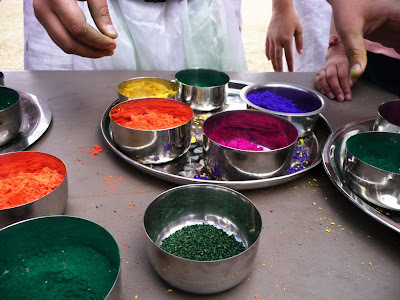 recipe looks yum,..;-)this yr played with just gulal,..though in delhi,its been quiet log since i played holi with wet colours,..now no mood too..lovely clicks,..
Delhibelle, true that. 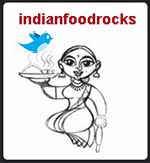 I've tried this with split moong dal (husked) and it's good that way, too! Anita, I am bad at planning ahead unless I have guests. Soaking has other better advantages - I thought you might spout those instead of a "few minutes." You don't know your neighbors? Nope, I wasn't talking about strangers. notyet100, it is yum! Gulal is difficult to wash off, yes? Jen, I have just three dal recipes but have been meaning to feature more. Dals are easy to make and I think I just take them for granted. A pressure cooker is a must esp. at our altitudes - else you're boiling the dal for hours to get it to cook. I'm looking forward to cooking and eating!! Looks like comfort food! I will definitely be making this. Will do this and let you know how it went! Hey Manisha, I do make this daal often but never added 'tupachi phodani'. I have tried using some little peanut paste once in a while adds some richness. Happy Holi to you and your family Manisha! Looks like you all had a gala time there. Nice to see Medha back in cheer! I love whole moongdal and only thing bothers me is that soaking time. You recipe looks so easy and delicious too! Our neighbours don't force us to join, thankfully. Maybe they have given up! 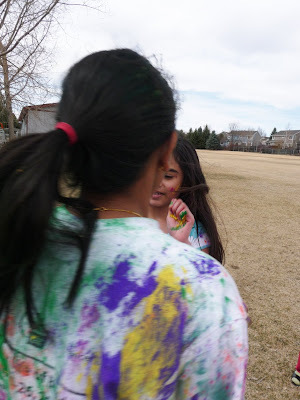 Hi Manisha, lovely posts, brings back memories of that colorful day when we were kids. In Chennai, at least where we stay, the day just passes by :). That's a lovely recipe - soul satisfying I would say. I played Holi every year till I was 20 in Mumbai because we lived in a colony and it was real, clean good fun. The night before we would bury potatoes into the Holika fire's embers and eat them the next day - delicious! The cardinal rule for everyone to avoid the colours - load up on coconut oil in the hair before stepping out as well as on the body! How did I miss this post? Well, I'm glad to hear that M is connecting with Desi culture this way, and that the weather permitted! I've been buying more moong lately... I think we all have as the prices go up for the other favorites; (I've been out of toor dhal for some time now but made a moong sambar anyway- works just fine!) This recipe that you found reminds me of some chhole recipes that I've come across- but with moong instead! Looks like a tasty formula...will try your "less garlic" tweaking, but I'm sorry: I'll need to return the chile-level back up to full blast or I'll never get it down... :-) Happy Holi- late- to you, and Happy Spring of course! I am writing this as the dal is cooking in my pressure cooker. I can tell it's going to turn out good. The aroma of ghee and khada masala has already filled my house.I am always in search of interesting recipes. 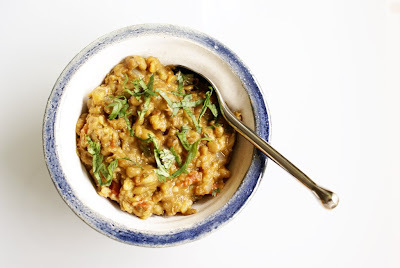 I made this dhal and it was perferct.A keeper as you said.Thanks heaps. Last night I made oatmeal pide (pita) to have with this dish which I made the day before: astoundingly good! Wowee... a keeper, yes! Hi Manisha! I tried out your recipe. I adapted a little(not the ingredients, just the technique....sorry! )...it was AWESOME! Thanks a bunch for sharing. I have a new found love for lentils now. Hi. Just wanted to say I tried your recipe and it was fantastic. I don't have a pressure cooker, so I soaked the daal overnight. I'm not the biggest fan of whole moong, but this was lovely. Thank you.